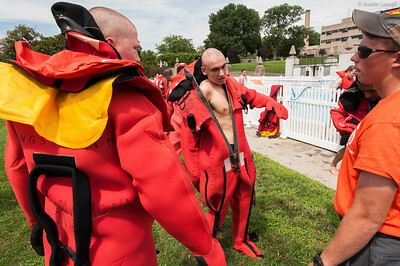 3rd Company 2nd Platoon candidates stand ready for instruction during water survival training on July 16th, 2014. 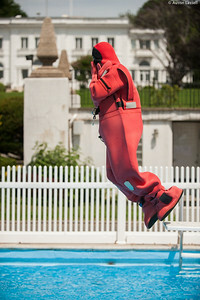 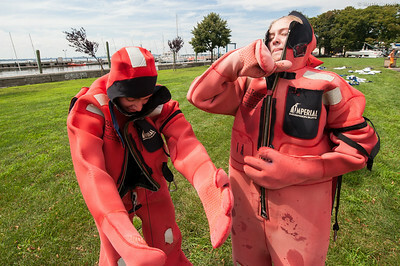 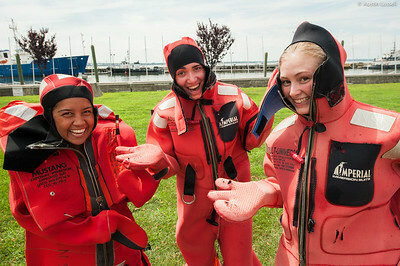 The candidates seen are wearing immersion suits, also known as gumby suits. 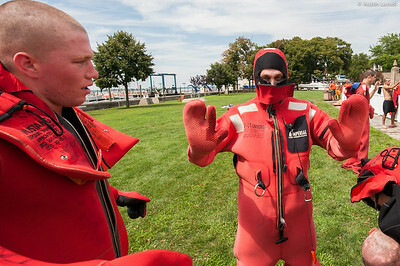 These suits work somewhat like a wet suit, but are more cumbersome as they meant for sea farer survival and are one size fits all. 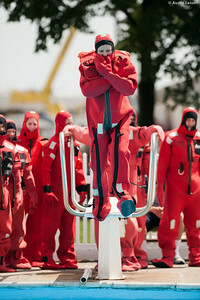 The suits are used as an alternative to lifeboats when abandoning ship. 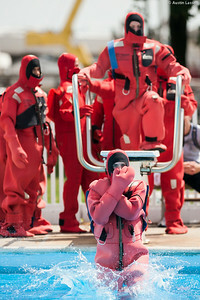 The suits keeps the person floating, warm, and mostly dry. 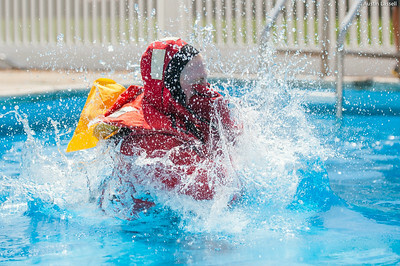 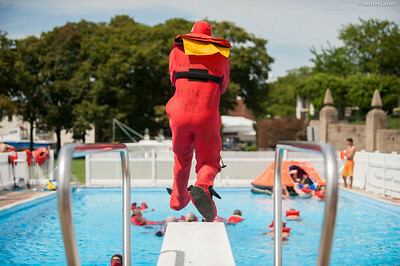 A 3rd Company 2nd Platoon candidate practicing the proper form of jumping ship while wearing a life jacket that is also known as a type 1 PFD (Personal Floatation Device), during water survival training on July 16th, 2014. 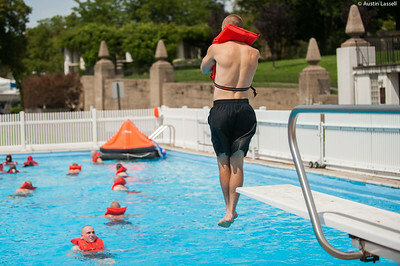 A 3rd Company 2nd Platoon candidate practicing the proper form of jumping ship while wearing "gumby suit", during water survival training on July 16th, 2014. 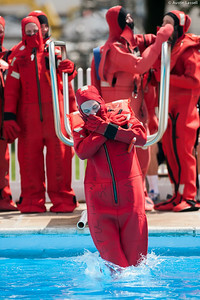 A 3rd Company 2nd Platoon candidate practices swimming while wearing "gumby suit", during water survival training on July 16th, 2014. 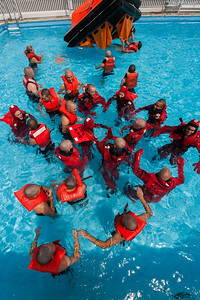 3rd Company 2nd Platoon candidates practice swimming while wearing "gumby suits", and type 1 PFD's during water survival training on July 16th, 2014. 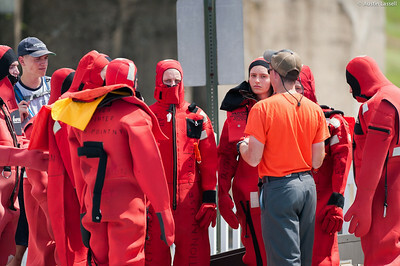 In the background a survival life raft can be seen. 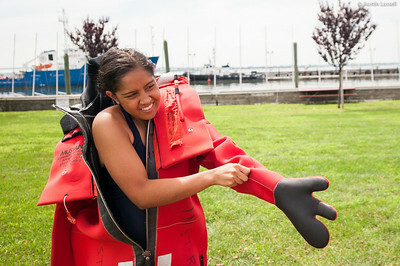 This raft is meant to seat 6 and is designed to aid in surviving an abandoned ship. 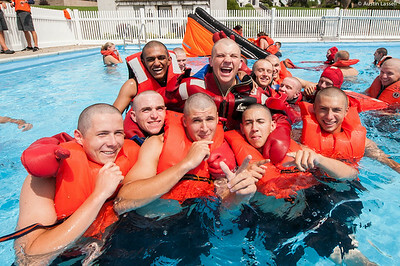 3rd Company 2nd Platoon candidates pose for a photo during water survival training on July 16th, 2014. 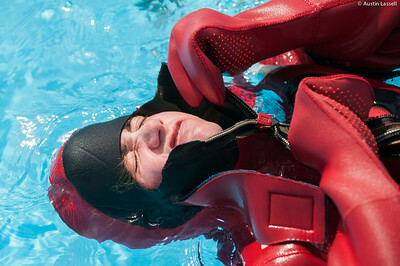 3rd Company 2nd Platoon candidates enjoy a lighter moment while wearing the cumbersome water survival equipment during water survival training on July 16th, 2014. 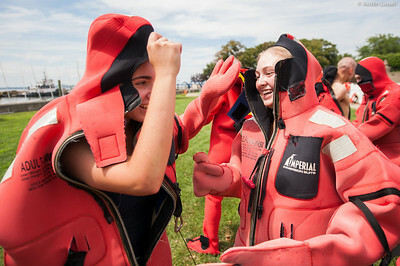 During the difficulty of indoctrination, strong bonds are forged, as seen in the photo, between those who were likely complete strangers only a few weeks previous. 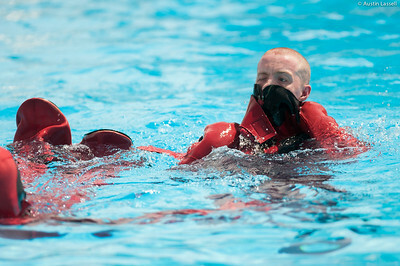 3rd Company 2nd Platoon candidates practice swimming while wearing "gumby suits", and type 1 PFD's during water survival training on July 16th, 2014. 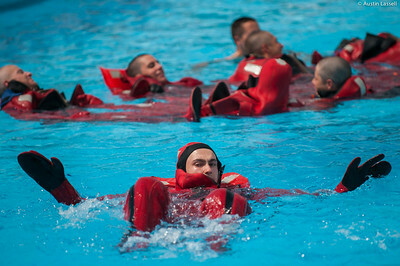 In the background candidates practice flipping a survival life raft while in the water. 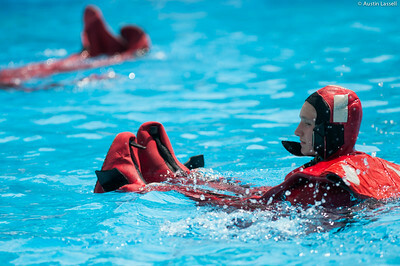 A 3rd Company 2nd Platoon candidate following training using the "gumby suit" during water survival training on July 16th, 2014. 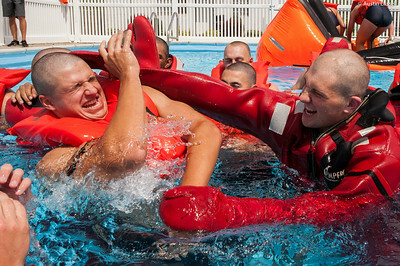 3rd Company 2nd Platoon candidates attempt to don the cumbersome "gumby suits" during water survival training on July 16th, 2014. 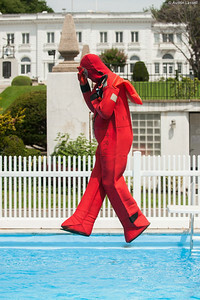 A 3rd Company 2nd Platoon candidate poses for a photo after donning the cumbersome "gumby suit" during water survival training on July 16th, 2014. 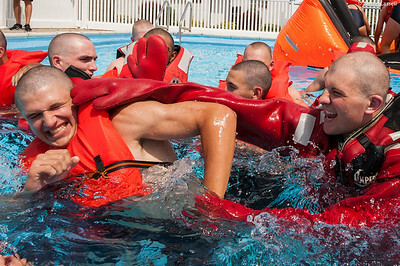 A 3rd Company 2nd Platoon candidate attempt to don the cumbersome "gumby suit" during water survival training on July 16th, 2014. 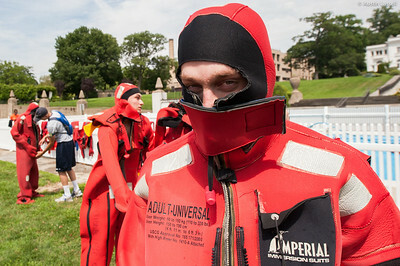 A 3rd Company 2nd Platoon candidate poses for a photo with only his eyes visible after donning the cumbersome "gumby suit" during water survival training on July 16th, 2014. 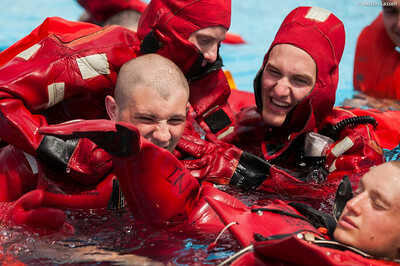 Three 3rd Company 2nd Platoon candidates laugh as they pose for a photo after donning the cumbersome "gumby suits" during water survival training on July 16th, 2014. 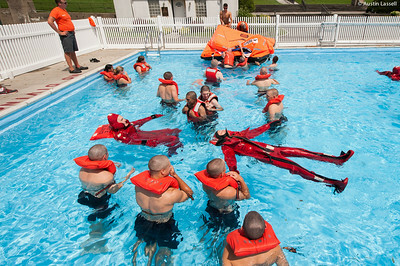 3rd Company 2nd Platoon candidates practice swimming while wearing "gumby suits", and type 1 PFD's during water survival training on July 16th, 2014. 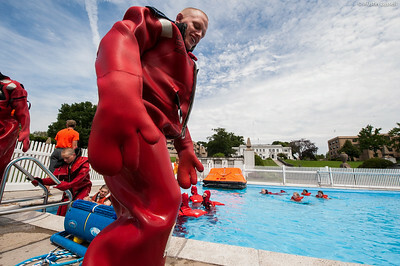 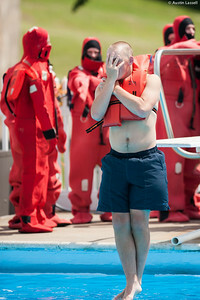 Midshipman Tyler Redinger 1st Classman enjoys a light moment as he dives into the poor in front of Wiley Hall following water survival training on July 16th, 2014. 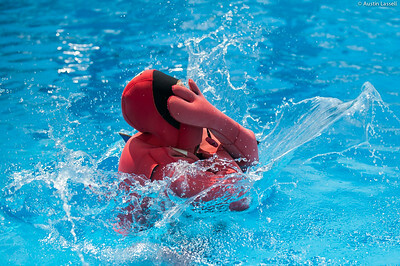 A 3rd Company 2nd Platoon candidate attempts readjust cumbersome "gumby suit" while swimming during water survival training on July 16th, 2014.